Bus fare costs only twenty centavos more than it used to, as of June 1. But the increase seems to be the tiny tip of an iceberg of discontent in Brazil’s largest cities. The hikes came as price rises in general stir memories of the 1980s, worrying investors and economists. In both cities, police are said to have engaged in gratuitous attacks on peaceful marchers and journalists (reports from São Paulo hint that police, engaged in complex crime issues involving gangs, may have actually done some protesting of their own). Today’s media portray the injured, as well as the effects of vandalism in both downtown areas– but have been criticized for not reporting fully enough. It may be that Rio’s attempts to improve public transportation have awakened a long dormant sense that the system is based on deep disrespect for passengers and employees, i.e. the lower classes. Poorly-trained and overworked drivers speed and don’t stop where they should, while many buses are still decrepit. Even the newly-built Transoeste dedicated bus lane has suffered from low-quality and incomplete construction, with dozens of cariocas injured and killed in accidents, since its inauguration. “The protests aren’t about the fare increase. I saw young people from different parts of the city, some politicized, some not, demanding popular participation in choosing the path our city is taking. There is a clear mixture of bodies and ideas in the streets – anarchists, soccer fans, people from the homeless movement, students, and even the good old political party youth with their flags, which fail to suppress the sense of a movement that is above all political parties,” says Bruno F. Duarte, a recent PUC-Rio communication/cinema graduate who was downtown last night. The twenty centavos could represent a tipping point in Rio’s general panorama, as citizens wake up to authoritarian government and a longtime lack of dialogue, as crime rates rise and the city prepares for two megaevents, this and next month. The protests, which involved violence and arrests in both cities, are taking place amid worldwide changes regarding the individual in society. Ashwin Mahesh: the City Council can never solve problems. Decentralizing money is the only game in town. 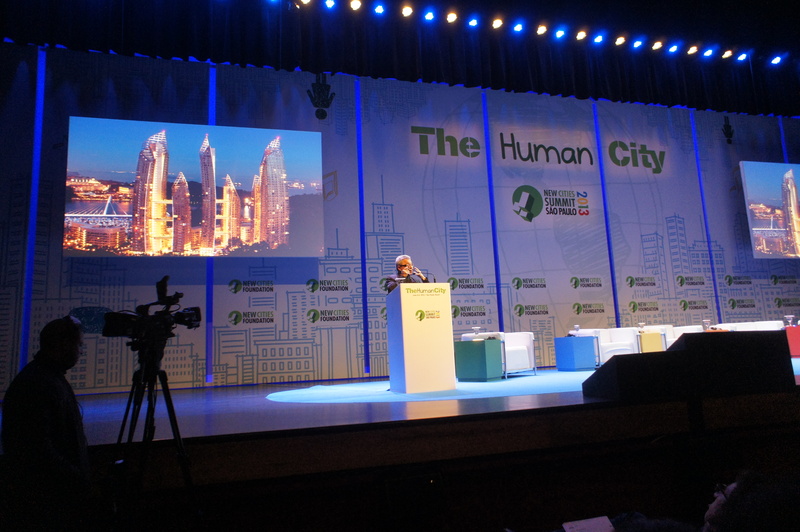 No longer must citizens look solely to government to address urban issues, said many participants in the New Cities Summit, which took place in São Paulo from June 4 to 6. 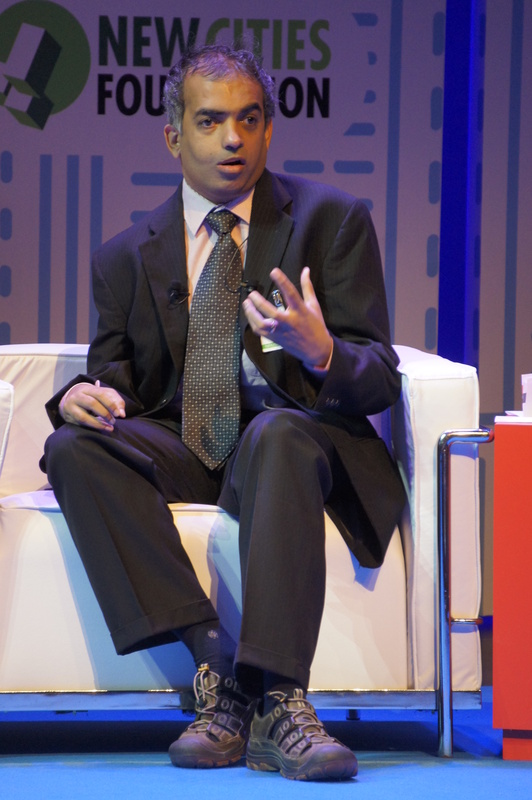 “Give up on the hope for strong leadership,” said Ashwin Mahesh, an Indian preacher of ‘open-source urbanism’ who redesigned Bangalore’s chaotic traffic system. Porto Alegre’s mayor, José Fortunati, presented that city’s participatory budget, initiated in 1989, carried out to this day. Oded Grajew explained how his Rede Nossa São Paulo keeps close watch on politicians and had a decisive role in the last municipal election. 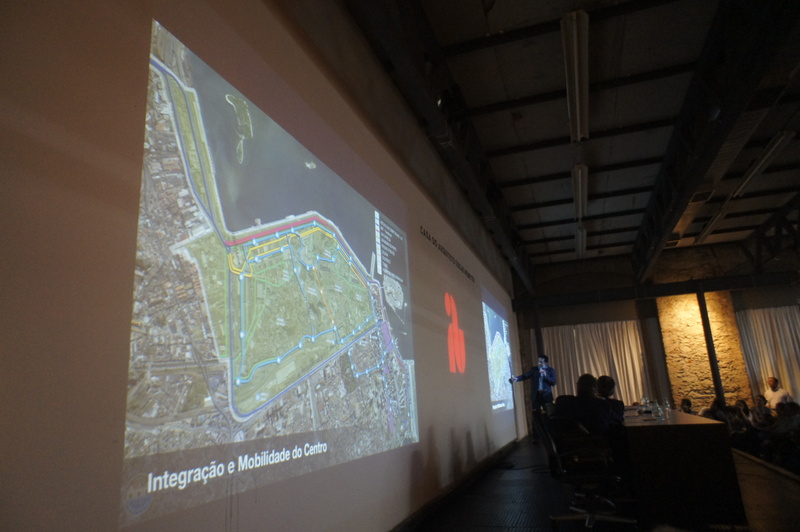 And Lily Liu presented a collaborative and user-friendly application that goes way beyond Rio’s 1746 site and phone number for reporting problems — and could soon be coming to the Marvelous City. The Summit brought news of a world trend. This new book presents research showing that urban revitalization can only work when networks are created among different class, social and political groups. This post links to a TED talk about architecture for and by the people. And this site celebrates and shares individual efforts to change cities. Of course, there must be collaboration between civil society and government, as a recent article in the New Yorker magazine points out, criticizing young geeks who worship their smartphones. In the last two weeks, well-established Rio architects and urban planners, who say they’d been excluded from decision-making until now, finally made themselves heard. 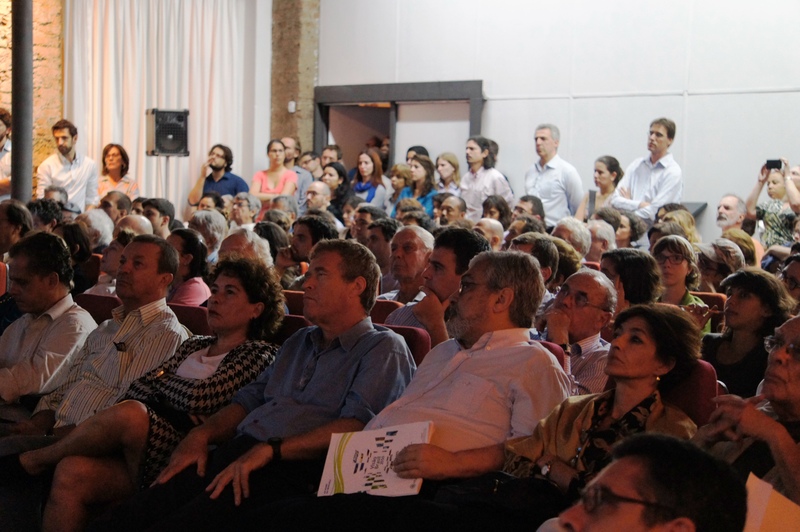 Following a small but heated OsteRio debate, the Rio chapter of the Brazilian Architects’ Institute held a meeting this past Monday, attended by at least 200 people, many of whom took the microphone to criticize the plans for downtown presented by Washington Fajardo, the city’s president of the Rio World Heritage Institute. As a result, mayor Eduardo Paes later said he may change mass transportation plans for Avenida Rio Branco and Rua Primeiro de Março. Those present also criticized the city for its removal and housing policies, as well as those which could exacerbate urban sprawl. 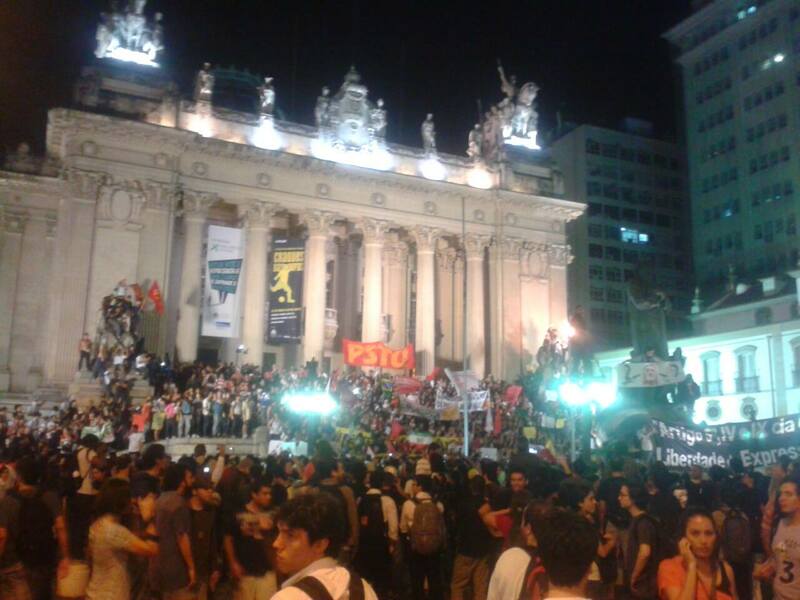 Protesters in both Rio and São Paulo say they’ll be back on the streets until fare increases are rescinded. They take heart in success achieved in a similar battle, in Porto Alegre. Some Brazilians also look to the protests in Istanbul, Turkey, as an example for the expression of urban discontent here. There, local issues seem to be conflated with national issues and dissidents are at odds with the nation’s prime minister. Here, Juscelino Kubitschek’s transfer of the national capital to Brasília in 1960 was partly meant to avoid such confrontations. But physical distance is less of a barrier than it used to be, society is changing and citizens may be starting to feel more powerful, at least in Brazil’s biggest cities. After last night’s violence, it remains to be seen how politicians and police forces –in Rio, grappling with so much at once — will respond next. Meanwhile, the bus still costs R$ 2.95 and change is scarce for three reais. This entry was posted in Brazil, Transformation of Rio de Janeiro / Transformação do Rio de Janeiro and tagged Ashwin Mahesh, bus fare hike Rio de Janeiro, bus fare protest Rio de Janeiro, community participation Rio de Janeiro, Daniel Libeskind, IAB-RJ, New Cities Summit 2013, Washington Fajardo. Bookmark the permalink. Note: Look for the Rio de Janeiro and Sao Paulo today. The population is outraged at the indifference of the government over the protests of gouging the transposrtes. Failure to citizens has caused fotes violence, including against professional journalists. Thanks for the note, Jonas, of course you are correct. Your post is splendid for many reasons, particularly that it’s the first one I see that links what’s going on in our largest cities to the wider trends of social participation, the rising of the lower classes in the country, and the role of cities in an interconnected global world. I would disagree with one little detail though: the media haven’t been criticized for reporting insufficiently, but rather for lying openly and siding with the repression (at least until yesterday’s events). As you know, it’s a very concentrated media, and certainly with tight liaisons to the very few families who control transportation in Brazilian cities. Thank you for this inspiring post. In the 70’s, Small Is Beautiful was written, and now there is a way for its ideas of social urbanization to be carried out globally by a new generation. That ordinary people can become a design team using small technology will free all strata of society from the divisive plague of capitalism as the sole source of means of production. Now there is another possibility of achieving a great deal without having to rely on pouring concrete and building expensive buildings, roads and soccer stadiums. Excelente matéria, direto ao ponto. Só uma observaçãozinha: o texto em português precisa de uma revisão, desculpe ser chata, sei que na correria nem sempre dá tempo. DEscontentamento é com E por exemplo. ops, você tem razão absoluta! foi muita pressa.